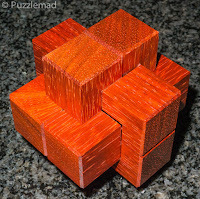 PuzzleMad: Is this a new puzzle category? Is this a new puzzle category? In December, Eric Fuller returned from his rather prolonged road trip and bamboozled us with quite a few nice new toys to choose from. I was just a bit cash strapped again, having been hit by several puzzler designers/craftsmen in a short space of time. I decided that I had to buy these 2 puzzles and pass on the others no matter how much I wanted them! At this point in time drooling was only going to make me dehydrated and not actually help me obtain more toys. Having spent the cash, I waited, and waited and waited for weeks. The tracking on the US post website said they were in the UK and the Royal mail site acknowledged it but did not say where they had gone. After 3 weeks, I got rather fed up and called them. They were, I was told, being held by customs and they would only return to the website once released. So I waited and waited even longer. I'd more or less given up hope when they suddenly arrived in my mail with no final customs demand and no sign that they had even been looked at! Phew! They were entirely intact! "oh no I've had this for ages - don't you remember that I bought it last year?" I can't argue with her because there is such a continual influx of girls stuff that I have ceased to pay any attention to what it is! But she has answered the door to postie with my stuff and knows whenever I get something new! These are something TOTALLY NEW! They might be a completely new puzzle category. The response was a snort and the comment that I always say that with every puzzle that arrives. Guilty as charged I guess - but I'm sure that I don't declare that they are a new category every time. To prove to her that there is something special - I just move a piece in Compressed and a few pieces in Round Trip and show her a hint of what is inside. There are some very odd shapes in there! I just get a blank look in return. I don't argue because the smell of burning flesh from the laser burning stare is becoming overwhelming and I don't want to risk a Whack! Ouch! until I have had a chance to play. "With the invention of the NOS (New Old School) puzzle series, Gregory took the six piece burr format and turned it on its head. The only thing more noteworthy than the uniqueness of the series was how difficult they are to make. When he sent me the plans for them a year ago, I turned him down because it just looked like a nightmare to manufacture. I wasn't wrong...BUT..." So here we see that they are referred to as the "New Old School" puzzles and you get a hint of why I thought they might be a new category. Finally at the IPP last year Greg produced 3D printed copies of them and showed them to Eric with a view to seeing if he might just change his mind when he saw them. It would appear that Eric's first thoughts about how hard they were to make was right, but luckily for me/us he still made a couple. 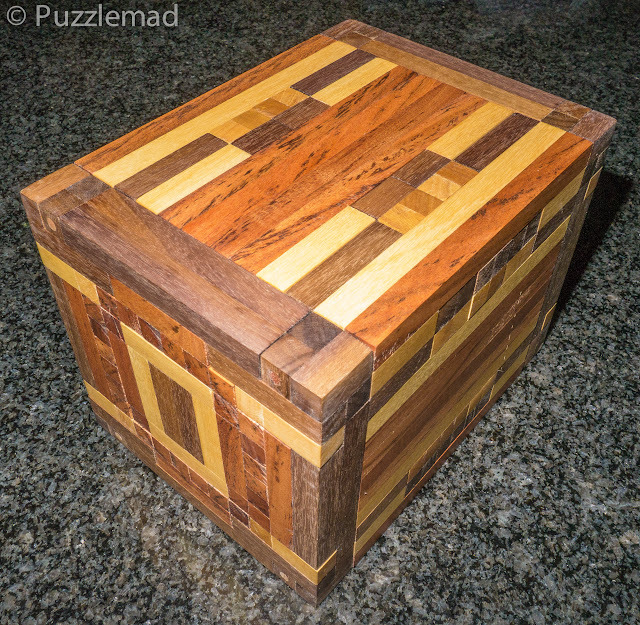 Diagonal cuts and pieces move together! 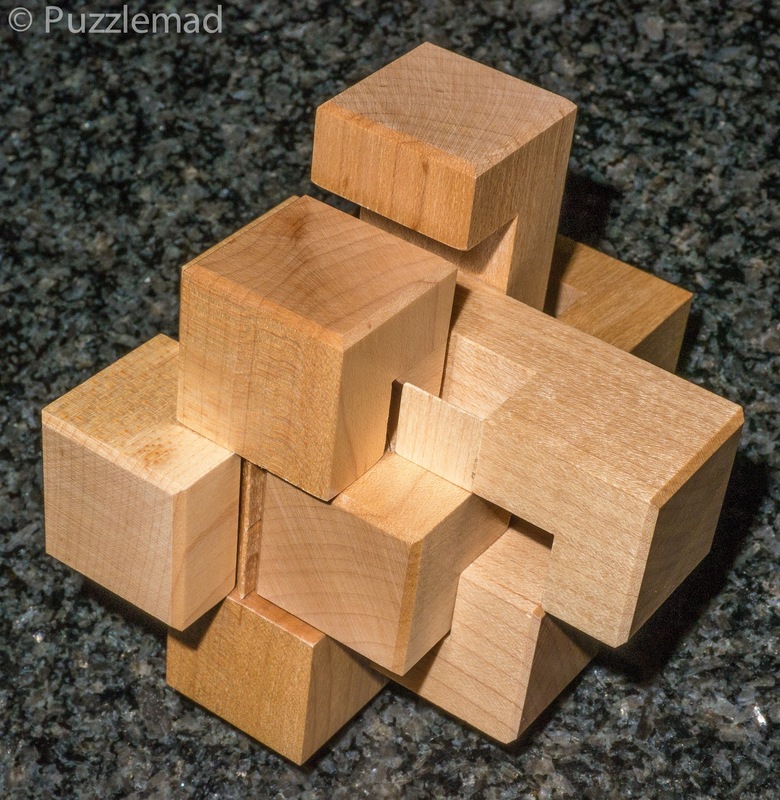 4 pieces move at the same time! 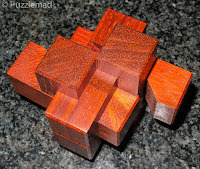 These were very exciting new puzzles to play with but she made me put them away despite waiting so long for them! I had to cook dinner and eat first! Damn! I really don't think she has her priorities right and if she carries on like that she may not last as the present Mrs S! Whack! Ouch! Sorry dear, I didn't really mean that. Whimper. After dinner and washing up I settled down in the living room with puzzles and a cat on my lap and started on Compressed (NOS1) - it is beautifully made by Eric out of Maple and unlike his usual burrs is much looser than normal. I suspect this is required to allow the movements to occur and aid overcoming the friction of the wood. After pushing and pulling different bits in different directions I realised that 3 pieces were very mobile and each reveals a diagonally cut piece of wood. Oddly sometimes pieces move together and block others and other times they move separately. I am still not entirely sure what governs that. After moving a few bits here and there, I couldn't make anything further happen. Hmmm! Eventually I cast my memory back to the Blind burr and saw tried a 3 way coordinate motion - after a little fiddling it worked beautifully and I had the shape on the left above. Look at the accuracy of those pieces! 2 sets of 3 identical pieces. I couldn't even remember which piece went where! After recovering from another laser burning stare caused by the shriek I let out during a TV program, I collected the pieces together and had a rather fun time trying to work out which pieces were required in which direction. I could tell which pieces were the final 3 to come out and I knew how they would go back in but it was particularly hard to work out the starting position of the other 3. 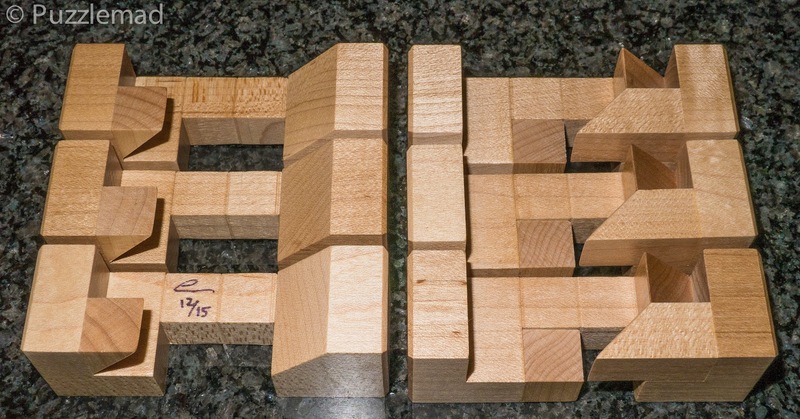 Eventually after recreating the initial coordinate move on just 3 sticks I had the start position. Putting the others back in was another coordinate motion and needed almost pinpoint accuracy, a steady hand and nerves of steel - none of which I had at that time. It took about 5 or 6 attempts before I reassembled the bloody thing. I quickly put it aside and decided not to do it again in the company of Mrs S or cat - I am pleased to say that over the subsequent weeks I have fully mastered it and love the movements! Gregory is a genius. "a very particular set of skills. Skills she has acquired over a very long nursing career. Skills that make her a nightmare for people like me"..... Gulp! Would you dare ask her to get up? No - I didn't think so. Round trip is truly stunning - it is the same size as the Compressed but made from Padauk and this sample is a really radiant red. 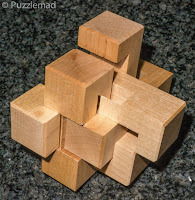 Initially nothing seemed to move but once you hold the correct pair of pieces and push/pull in the right direction there's a lovely surprise as 4 pieces all move in a rather surprising way. After that it works as a more conventional burr with normal linear movements. 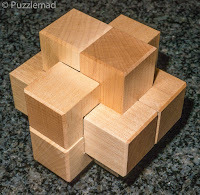 However, the pieces are locked together by the diagonally cut ends being held in diagonally cut holes and it requires a very specific sequence to allow them to relinquish their grip on each other. It actually took me a further 20 minutes to discover a very well hidden move and I had the 6 burr pieces apart and draped over the cat. Overall this is a level 4.8.3.2 burr. 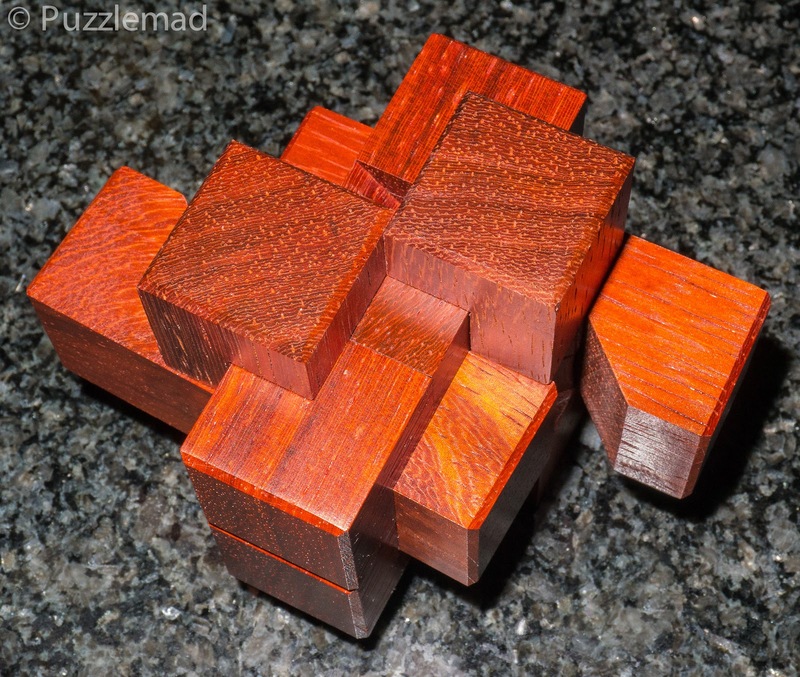 Stunning colour wood and very confusing piece design. The reassembly is fairly logical if you've paid attention to what you did during the disassembly. I've solved these repeatedly over the last week or 2 and absolutely love them - they even made me go back to the blind burr to play with that too. There are 7 of the NOS puzzles in the series and I do very much hope that Eric makes them all but I also hope that he does them in stages as I don't want another 5 requiring my cash all at the same time! I suspect he will spread them out because of the extreme difficulty in their manufacture. I have to show off the Wish Cube! It was originally intended to be one of the puzzle boxes that went into the incredible Apothecary chest made by Rob Yarger and 12 other craftsmen. Johan wasn't happy with the design and eventually withdrew from the collaboration. 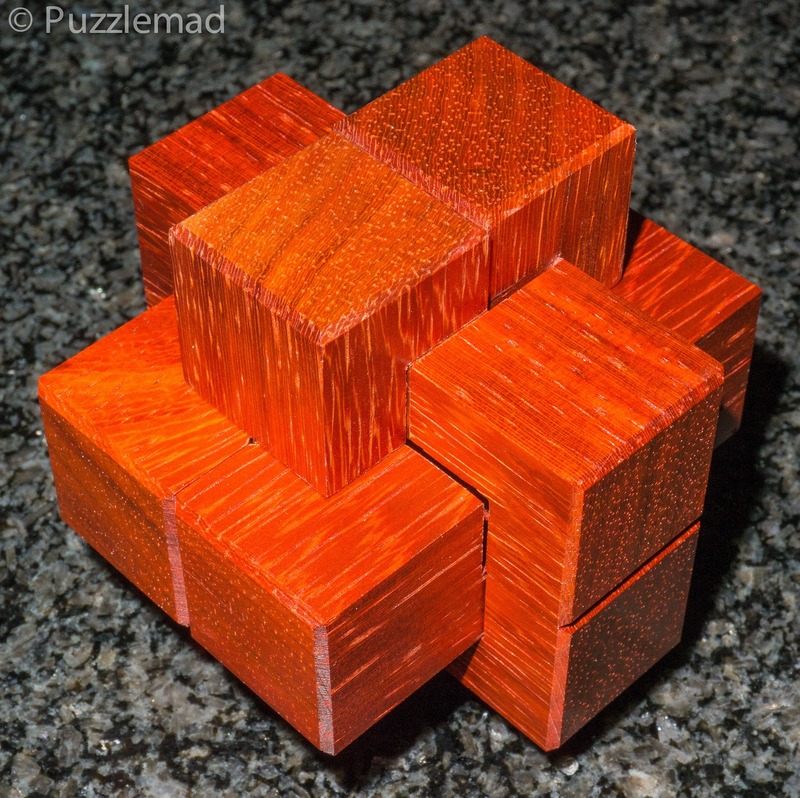 I am very pleased to say that he has collaborated with Jack Krijnen (he who made one of my gorgeous burrsets) and came up with a gorgeous cube with multiple facets to the solution. I am not ready to review it just yet as I am only part way through solving it. But keep an eye out hopefully soon. I bought both these NOS burrs, they are great! I classify them as coordinate motion puzzles disguised as ordinary 6-piece burrs. Superhero? I hadn't thought of that! I am now wondering whether she is a super villain and that might explain the Whack! Ouch! that I receive so often! She likes our cars and has honestly not tried to melt one...... Yet! I like your classification better than mine. Enticed away from Wood by a Friend?